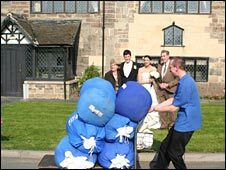 BBC NEWS | UK | Magazine | How hard is it to photograph a wedding? A couple have successfully sued their wedding photographer for his shoddy coverage of their big day. Anyone can point a camera at a happy couple, but what pitfalls do the professionals face? The memorable shots from Marc and Sylvia Day's wedding are unusual, to say the least. Decapitated guests, a ceremony hardly visible through the gloom, and random close-ups of... not the bouquet, or a snatched kiss, but of carriage wheels. The three-year-old bridesmaid - caught in one snap without her clothes on - could have done a better job. The Days are so upset that they've taken their photographer to court for breach of contract over the £1,450 photo and video package. But how hard can it be to get great shots at a happy occasion, where everyone is dressed up in picturesque locations? Most guests bring along their own cameras, after all. Harder than it looks, says Paul Cudmore, a past winner of Wedding Photographer of the Year, who has been in the business for 18 years. "It's all about emotions and capturing emotions. And obviously you've got to look out for vans driving past in the background." The secret is in the planning - knowing what the bride and bridegroom want, who will be there, where the best locations are. Then there are the timings. "Brides are always late arriving, so you have perhaps four or five minutes to get shots you'd normally spend an hour on. "And brides and grooms - most of whom haven't been married before - don't realise that it can take quarter of an hour for people to leave the church and assemble for photos. I've had reception venues phoning me to ask where everyone is." Most tricky of all is the group shot most couples want, if not for themselves, then for Mum and Dad, Auntie Mabel, and their grandparents. To get that many people to stand in the right place, to look in the right direction - and to smile at the right time - can be like herding cats. "It's all about communication, making the guests and the wedding party feel relaxed and happy," says Mr Cudmore. 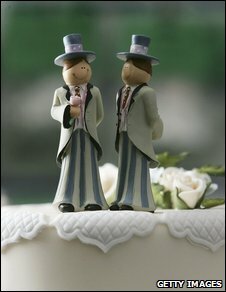 "At one wedding, a guest told me that at the last wedding she went to, the photographers were blowing whistles at them." Neil Thayer, a wedding photographer based in Bath, says it's the photographer's job to keep everyone happy. "It's like getting all your family together at Christmas - some people don't get on, there are husbands and wives who have split up and come together for this big set-piece. There can be a lot of tension. On one job I was on, there was very nearly a fight." And even if fisticuffs aren't on the horizon, many of those being photographed simply want to crack on with the celebrating. They complain that the photos are taking too long, and itch to get off to the bar. How does Mr Thayer keep things moving along, and still get the right shots? "I never stop talking to people, even if it's making silly jokes. I always make sure I work with the ushers, and know their names - because they will know the names of the people I don't." Then there are the naturalistic reportage shots popular with couples today. The only trouble is, people often freeze when they sense a camera lens pointing in their direction. "They stop, crack a smile, then say 'Are you finished?' I say yes, they breathe a sigh of relief, relax, and start talking and laughing again. I keep shooting," says Mr Thayer. "The bride and groom are not often together," says Mr Cudmore. "She'll be on one side of the room talking to someone, and he on the other. You have to instruct them to stand next to each other - not fake reportage, but staged reportage." Both live in fear of mechanical failure, whether it's a camera card corrupting (which happened once to Mr Cudmore) or car trouble (Mr Thayer locked his keys in the boot and almost missed the reception). "I always take two cameras and three or four lenses," says Mr Thayer. "You've got to have back-up kit - I always take double. And I always pack a needlework kit in my bag in case of accidents," adds Mr Cudmore, who often finds himself helping to tie cravats and advising relatives on which side of the church to sit. And if there are small children involved? "So many people tell them 'you've got to be good, you've got to smile'. Then these little four and five-year-olds build up this big worry. I tell them 'we're going to have lots of fun, the bride will look like a princess and you'll be helping her'." His advice for choosing a photographer for the big day? "Look at their portfolio and make sure it is all their own work." I've only started in this industry and shot my first wedding recently. It's an incredibly daunting task. The timing, the constant awareness needed to capture moments, the technical difficulties in low light, people herding, research, and the time consuming post-processing all make this a lot more difficult than imagined. People just dive in, thinking a £500 camera with a built-in flash will cut the mustard. Not a chance. I've spent over 4k on gear, and need more lenses and light tools, six months of deep research and practice, 12 years using Photoshop professionally as a graphic artist. I'm still nervous about every shoot. I was married just outside of Gloucester 13 months ago today and I still get upset thinking about our wedding photos. We scoured the region for a photographer and had several discussions with him about the shots and style we wanted. Although I remember being nervous on the day how shots would come out, it wasn't until a week later that we received the final images and were absolutely devastated. None of us alone after the wedding, or full-length shots of my dress, or with my bridesmaid or family. Family shots like "where's Wally". We wrote to him afterwards to ask about some make-up shots and let him know our disappointment but received no reply. It all sounds so trivial, but it nevertheless hurts when there's no picture taken you can bear to have on display of your wedding day. As a professional photographer I can categorically state that wedding photography is a very special skill, a skill which I do not have. There is no second chance, no room for any error and no room for a small mistake. The ONLY way to learn wedding photography is to work as an assistant to a wedding photographer - not an easy job to get, either, as you are a potential threat to their business. I'm one of the new breed of photographers I'm afraid. I've had some tutoring and attended classes in lots of photography disciplines, but none of it can really prepare you for what you will face on a real shoot. I've been fortunate that I've been chosen by friends to shoot weddings for cost of printing only or for free, and they have been happy with my work, but it's clear the real professionals earn every penny. It's exhausting, stressful work. You only get one chance at taking these photos, and the pressure and responsibility doesn't really hit you until the big day. Best left to the pros. We also have terrible wedding pictures. The only one we have framed was taken by my father and we never look at our album as the photographer's pictures are dreadful. We plan to renew our vows after 10 years (four years time) and have some decent pictures taken by a talented photographer, and as a bonus our children will be there too. We didn't have a photographer at our wedding - we couldn't face spending hundreds of pounds to have a stranger boss everyone about for hours while we all got tired and bored. Our friends and family took lovely shots, we have a beautiful album, and everyone looks so happy and relaxed because they are being photographed by people they know. We had a fabulous photographer for our wedding, not stupidly expensive and he really captured the mood of the day. It was only after we booked him we realised he had won Wedding Photographer of the Year. Friends of our paid twice as much for theirs, who managed to get a fire extinguisher in every photo of the bride before the ceremony and tourists' heads looking over the castle walls. I got married in pre-digital times, 14 years ago. The photographer took three rolls of film, but when they were developed, the machine broke and two of the films, including the one with the church pix, got completely over-developed. While we only have happy memories of the main part of the ceremony, the lab made some manual black and white prints of as many church pictures they could, including some close-ups of bride and groom. They look absolutely stunning and everyone thinks it was done this way on purpose. I was very impressed by the skill and dedication of everyone involved to save as many pictures of our special day as possible. 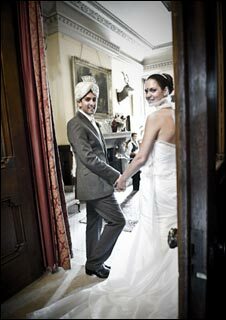 I worked as a wedding host at a country house hotel and saw all kinds of photographers come and go. The digital era appears to have promoted a scatter gun effect in which the man behind the lens takes thousands of shots and hopes to get a good one. The best we worked with - and the ones who had the best rapport with guests - were the old school ones. We would support them and herd guests into the right places at the right times, but high cost doesn't mean high quality. Our recommended photographer was about mid-price and did Hasselblad work for the main photos and his daughter caught people in unguarded moments with a digital camera. A great pairing with an old school camera and new fangled digital one. Many people are not using professionals because they think that the images shot by their guests will suffice and see it as a way of cutting costs. But a good wedding photographer can make the day run so much more smoothly. As well as taking pictures, the photographer is the one person prior to the reception who can organise and stage-manage the event ensuring that everyone is in the right place and guiding things along. It is an immensely stressful job with a huge amount of responsibility and certainly not for the faint-hearted. Yes, pros can be expensive but it's a three day job when all of the pre-organisation, editing, and post production is taken into consideration and so costs need to be covered. We just asked guests to share their pictures with us. We ended up with the most fabulous photos and one guest even put an album together which was very special. My advice is not to pay out - the pictures we ended up with are exceptional quality, very natural and really catch the essence of the day. As we were living abroad before our wedding, my parents arranged everything for us, so when we got back the photographer was already booked. At our first meeting she said she'd driven by the church (chosen because I'd know the minister my whole life, not for its appearance) and on a scale of 1-10 it rated about 3 for attractiveness, turning her nose up. I asked if she'd walked around to the little churchyard - of course she hadn't, should have fired her right then. She decided we would do most of the photos at the reception in a concrete courtyard, with the wrong lighting, shadows, a bench poking into half the photos, people squinting. She upset half the guests, bossing them about & as she only had a hand-held camera, they thought she was another guest. The photos are very average, but my friends took much better (=relaxed) ones. The technique and equipment is only half of it - the bedside manner counts for a lot. This was pre-digital - these days your guests can do it all, just have a list & maybe one friend to make sure which group shots you don't want to miss. I was told by the person who taught me the science behind the camera, about wedding photography: "The ceremony lasts an hour, the cake may last three days, the bride won't fit in to her dress in five years, but... your photographs will have to last a lifetime." That mantra has stuck with me and in a business where the end product is still very disposable, it is one reason why I very rarely take any wedding photographs; because when pressing the shutter release, the image not only has to look good tomorrow, it still has to be appreciated 10, 20 or 30 years down the line. At our wedding, our photographers (she had a team working with her) were brilliant. Never in your face and capturing emotion and moments and lighting... the pictures are as much art pieces as they are printed memories. Eight years later and we still keep in touch with her. We've been to several of her exhibitions and have one of her photos (not of our wedding) hanging in our hallway. Bottom line - it's not the equipment or luck, though those help. It's the eye of the artist holding the camera. Over the past 10 years I shot countless weddings. I came to hate wedding photography as it is repetitive and very ungrateful. I admire those who are willing to cope with weddings. Stopped the whole wedding business about a year ago and switched entirely to studio work. And I love my photography again. We didn't have a massive budget for our photographs, and found the extortionate prices some photographers were charging truly jaw-dropping. Our photos were OK, but I really believe that I could have done as good a job. Had I not been the groom, I would have done them myself. That takes me back. Our photographer was brilliant, kept chatting, got all the shots we wanted and was a reasonable price. Not the 1000s quoted above. You need a good photographer. It is an art. I know someone who had a friend of a friend to do their wedding photos and they were just snapshots. Nothing outstanding for the mantlepiece. It takes more than just a good camera and a flash. It's all about reading a situation, learning how to use light and understanding group psychology. Not to mention weddings always put you in impossible situations... situations where the biggest names in photography would say "no way...you can't do that". So if you don't think you can work your way out of any situation, don't even think of ruining someone's wedding. Every day I see wonderful photographers on Flickr. Amazing work from amazing people. Thing is about 90% of them should never go near a wedding. Photographing things and photographing people are two very different things. I got remarried last November in a Gothic style of wedding, which was new to the photographer. Although the finished album turned out fantastically, the photographs on the day were a real chore. After the wedding itself, it took about an hour for all the pictures to be done in every configuration imaginable... and 20 minutes after the guests had left for the reception. It started to feel as though the day was more about him and his pictures than about me and my husband. This is a sad reflection on today's industry where anyone with a camera can now call themselves a photographer. As a professional and full-time photographer for 27 years, I have seen the standards within this industry eroded because of amateurs and weekend photographers who posses very little in the way of technical training or knowledge, vocational qualifications, no professional affiliations, no insurance, and no ability. I hope this is a valuable lesson and wake-up call for non-professional photographers that sub-standard work is not acceptable, and that they should get trained and get affiliated with a photographic organisation. ...nothing. Not even the tree 30 feet away from my bedroom window. The DENSEST fog in many years had descended. It could have been a disaster but their photographer was a genius. She took close-ups of everyone, little vignettes of buttonholes or bridesmaids' beaded pumps or family groups inside the venue, then returned on the next decent day and took the vistas the couple had been so enchanted by. When the prints were placed in the album, the entire effect was eye-moistening. I've been photographing weddings for over 10 years now and the industry has changed substantially. There are many photographers out there using sub-standard amateur equipment. The problem with underexposed photos in the church above is caused by the use of cheap lenses on a cheap camera body - 99% of churches do not allow flash photography so you need wide aperture lenses to cope with the low light conditions. The problem is that many people believe wedding photography is a less professional art than perhaps fashion or editorial. It is in fact probably the most demanding area of photography there is. You only have one chance, the lighting conditions are constantly changing and you have to keep people happy at the same time. I did a photography degree but only experience can teach you the pitfalls of this industry. We just didn't have the money to spend over £1,200 on photographs, so we bought loads of disposables and got people to send us pictures they had taken on their own cameras. The quality of these was brill. Your mates know how to take your best picture. I've stopped agreeing to be "official" photographer at friends and family weddings. It is simply the most stressful role to play and the results can be hit and miss. My tip: get a nice long telephoto lens and be inconspicuous and take candid photos after you've done all the staged cheesy stuff. It also helps to know your location beforehand. Give me landscapes and nature over excited, tipsy wedding revellers any day of the week. I used to provide tech support to a number of clients including a wedding photographer. Every time he wandered in with his latest video editing disaster I cried a little on the inside for the poor victims. It wasn't my place to tell him he was destroying dreams but I think anyone looking for a photographer should ask to see some kind of portfolio. There really are some muppets out there who see an easy few hundred quid in the making.